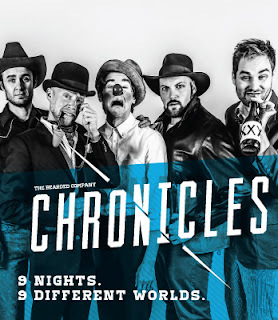 Cherry and Spoon: A Night at HUGE Improv Theater: "Family Dinner," KINGS, and the Bearded Company's "Chronicles"
A Night at HUGE Improv Theater: "Family Dinner," KINGS, and the Bearded Company's "Chronicles"
Who couldn't use more laughter in their life? A great place to guarantee that is HUGE Improv Theater in Uptown, with shows every night except Tuesday. 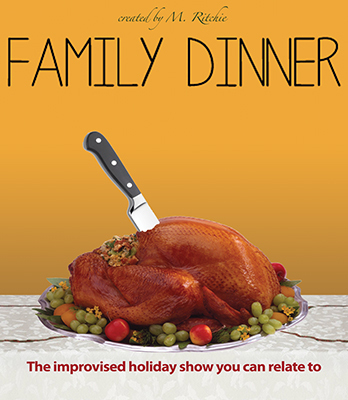 'Tis the holiday* season, which brings my (and apparently may people's) favorite improv show - the utterly delightful Family Dinner. Every Friday and Saturday through the end of the year, a group of talented improvisers (nightly cast TBA from this lovely group) put on a very funny, very real (ish) production of a typical family dinner, including eating an actual dinner. It's super popular and almost always sells out, so make your reservations in advance. And while you're there, why not stay for another show or two, like I did? Friday nights include KINGS and The Bearded Company (keep reading for more on them), while Saturdays are The Mess (whom I've seen a couple of times before) and A Christmas Carol: Unscripted (I might need to go back to see this one). The full schedule (and reservations) can be found on HUGE's website. The premise of this show is simple: a group of friends and family gather together to celebrate an unnamed holiday over dinner. But the execution is quite complex as characters and relationships are created and built upon. Adding to the complexity is the secret (suggested by the audience) that each person has, known only to them, to divulge if/when/how they see fit. But the performers (on the night I saw the show: Alexis Camille, Janay Henry, Justin Michael, Lizzie Gardner, MJ Marsh, Sam Landman, Seniz Yargici Lennes, and HUGE's new Artistic Director Rita Boersma) pull it off beautifully. Act I includes the getting ready, travel to, and arrival of guests, which in this scenario included a couple, her two sisters and their guests, and his two sisters. Then, after a short intermission, it's dinner time! A long table is brought out with actual food on it (including a turkey - this was the day after Thanksgiving, after all). The guests are seated and begin to pass food around and eat, all while carrying on one or several conversations. It's a bit chaotic, as such dinners often are, and this is when the big secrets come out. Perhaps the reason why this show is so popular is that we've all experienced weird and/or awkward and/or funny family dinners, although perhaps with less FBI bugging, secret keeping, and selling of family heirlooms. The show is relatable and familiar, but in an extreme and hilarious kind of way. This improv troupe consisting of Erin Sheppard, Gubby Kubik, Hannah Wydeven, Joe Bozic, Josh Kaplan, and Lupe Muraszewski (five of whom performed Friday night) introduced themselves as the weirdest improv you'll ever see. After seeing their 50-minute set, I concur. It was super weird, but gloriously so. Interestingly, the scenes did stop with a completely new one started when one member runs across the set, as I've often seen in improv, but rather everything just flowed from one scene to the next. Sort of all related, but also bizarrely not. Kids were playing hide-and-go-seek, then one kid absorbed the others into her body, then we went inside her body where the kids were hanging out, then we were back outside again, and there was some sort of clinic, and a comedy club doing hokey routines, and a bunch of other stuff I feel like I might have hallucinated. They also do sound effects on mics, which mostly made no sense at all, except to increase the weirdness factor. Super weird and unique improv, and very funny. 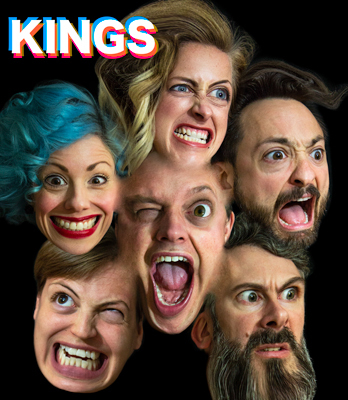 You may know The Bearded Company (as I do) from their Swords and Sorcery improv show at Fringe the last few years, in which they improvise a very nerdy and fun fantasy play. 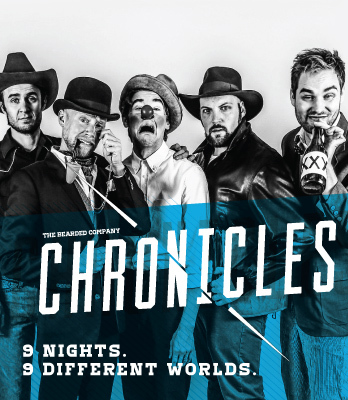 They've been performing at HUGE for years, and currently are in the middle of a run of Chronicles, in which each week they tackle a different genre of storytelling. I happened to see one of my favorite genres - the sitcom. With a suggestion from the audience of a title and catch phrase (Shucks, Dad! and "why did you do that?," the former being used more frequently) the ensemble of Joe Rapp, Lucas Vonasek, MJ Marsh, Tyler Michaels, and Tyler Mills performed a pretty typical (if extreme) sitcom, punctuated by appropriate laughs, awwws, and groans from the audience and sound booth. There was the typical sitcom family, with kids and parents alike learning important lessons, the funny situations (son is so nervous about giving a persuasive speech he pukes, daughter hangs out with a couple of smoking tough guys), the eccentric grandma who gets all the applause and one-liners, and even a random guest star (Brett Favre?). It's fun to watch the guys create a sort of cohesive story around the barest hint of an idea. HUGE Improv Theater is always a good bet for an entertaining evening. Maybe even moreso now in the holiday season, if you need some entertainment that's a little less sugary sweet.